Welcome to Day 16 of my #100DaysofBulletJournalIdeas Project! Dreams have always seemed like a parallel universe taking a closer look into our subconscious to me. I feel that what we dream may speak to what we're going through in our lives. My dreams have always seemed so vivid. Sometimes I wake up at the end of one with a clutching feeling in my heart as I reel from what I just experienced in dreamland. I breathe and remind myself that I'm right here, in my bed, in the real world. Dream Kim vanishes away into a fresh memory as I gather myself. I furrow my eyebrows to remember what happened and turn to my notebook to scrawl down as much as I can remember. After reciting as much as I can about my dream while it's still fresh, I consider the symbols that appeared and pick them out one by one. What could those symbols mean? I have my theories, but curiosity leads me to search online to help me interpret my dreams. I turn to Dream Moods to look up dream symbols and read the interpretations to see if any of it applies. As curious as I am while I soak up the words, I still take it all with a grain of salt because I'm naturally skeptical of all things. Dreams have always seemed fascinating to me. What do they mean? Why did I dream what I did? Understanding what they mean is something that's always mesmerized me. From what I've discovered online, dream interpretation is something that dates back to clay tablets, meaning this has interested others as well for a very long time (phew!). Have you ever woken up in a sweat crying out because of a nightmare you had that just seemed so real? I feel that just sounded like a horror movie voiceover. Sometimes I find that I tend to dream about the last thing I thought about just before I fell asleep. I've been thinking a lot about my friends lately and as a result, last night I dreamt that I was hanging out with a few of them. That would be a solid dream since I haven't seen these particular friends in a long time, except for the mood of it. The overall feeling of the dream was strange. The dream had this unnerving ominous feeling to it and when I woke up, I felt kind of spooked. What could it mean? 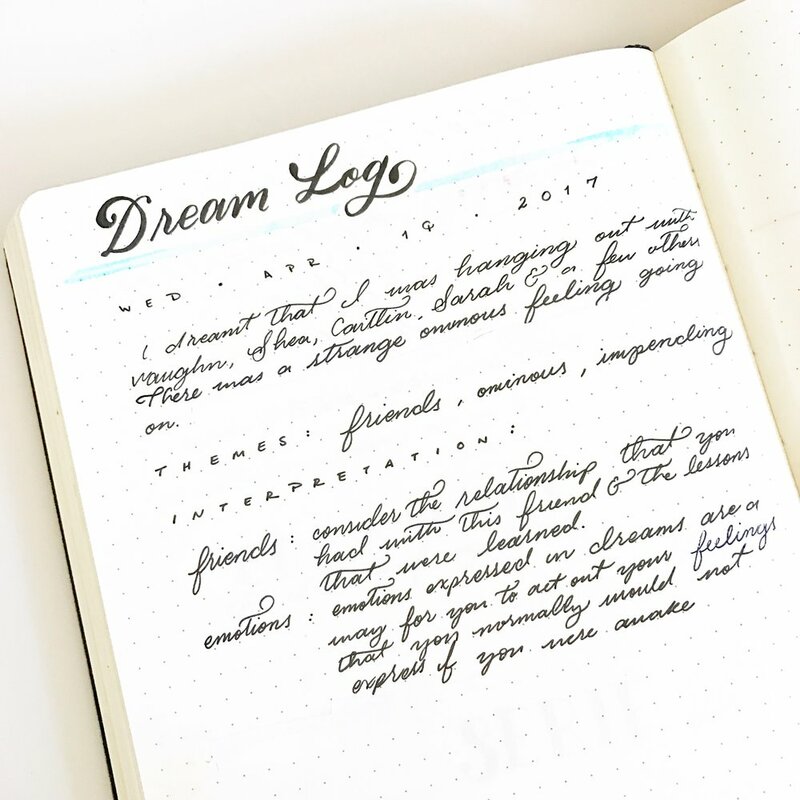 I turned to the next blank spread in my Bullet Journal and wrote across the top, "Dream Log." As I was writing out the dream, I realized this would make an interesting post for today to share my process for investigating what my dreams mean. 1. Write out as much as you can about what you dreamt. 2. Pick out symbols from your dream. Who was there? Was it a stranger or a friend? How did you feel? What was the setting? Think about the details. The more symbols you can pick out, the more you'll be able to look up. This is optional. Some may choose to only write down what they dreamt as a log, but for the curious, looking up what the symbols in your dream meant may help you reflect. This is why I look up my dreams, to see whether the interpretations for symbols relate to me in any way. If I find meaning in them then it's worth that extra investigation. That awareness helps me understand myself better. Is it true? Am I dealing with that in some way? What meaning can I take from this? I recommend checking out Dream Moods, I've been using that site for about a decade now to look up my dreams and it's always been interesting. Do you ever look up your dreams to find out what they mean? In a word doc, many years before Bullet Journaling. This made it easy for me to cut and paste the interpretation, but writing it down helps me focus only on what's relevant. In my long-form journal. The stream of consciousness from writing out what I remember is cathartic. When I go back to read old journal entries where I described the dreams, I can imagine the dreams again as fresh as when they happened. Sign up to the Sunny Newsletter for weekly updates on the #100DaysofBulletJournalIdeas project!